The HKU Scholars Hub is the current research information system of The University of Hong Kong. 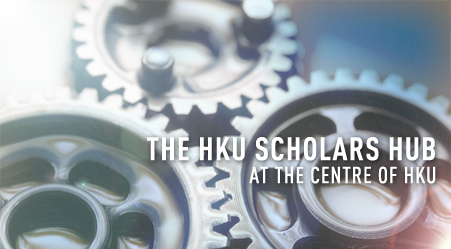 As a key vehicle of HKU&apos;s Knowledge Exchange Initiative, The Hub aims to enhance the visibility of HKU authors and their research, and to foster opportunities for collaboration. Mar 2019: HKU Theses On Amazon and Other Online Retailers (Update). Dec 2018: HKU Theses On Amazon and Other Online Retailers (Update). Oct 2018: Report on the Sale of HKU Theses on Amazon and Other Websites. Oct 2018: Announcing the 2018 HKU&apos;s Top 1% Scientists. Sep 2018: HKU Theses On Amazon and Other Online Retailers (Update). Jun 2018: HKU Theses On Amazon and Other Online Retailers (Update). Apr 2018: HKU Theses On Amazon and Other Online Retailers (Update). Oct 2017: Announcing the 2017 HKU’s Top 1% Scientists. Aug 2017: The revamped HKUL Research Data Services website. Apr 2017: Launch of the Research Postgraduate Hub. Apr 2017: HKU Theses On Amazon and Other Online Retailers. Jul 2016: The Hub adds Datasets. New deposit page coming soon. Feb 2016: Updated to DSpace 5.2. Added global search capability under Quick Search tab. Jan 2016: The Hub is No. 1 in Asia and 41st worldwide, according to Webometrics. Apr 2015: Updated to DSpace 4.1, added mobile responsiveness. Oct 2014: Created Quick Searches on different types of researchers. May 2014: Created ORCID accounts for all HKU Professoriate staff. Mar 2014: Added "Invited Lectures & Keynote Speeches" to HKU ResearcherPages. Feb 2014: Added teaching course lists to HKU ResearcherPages. Feb 2014: The Hub is No. 1 in Asia, according to Webometrics. Jan 2014: Upgraded to DSpace 3.2 with DSpace-CRIS. Sep 2013: Sage Open. Pre-paid article processing charges for HKU authors! Sep 2013: Hub lower level pages redesigned. Aug 2013: Upgraded to DSpace 1.8.2 with DSpace-CRIS. Mar 2013: Membership in professional societies added to ResearcherPages. Jan 2013: Web service for extracting Hub data. Interested? Write! Jan 2013: Professional memberships added. An example. Jan 2013: New data types & functionality added, described here. Nov 2012: "Open Access to Information"
Oct 2012: Networks of Collaboration, visualized & tabulated. Check your favourite ResearcherPage! Oct 2012: HKU&apos;s Top 1% results announced for 2012! Sep 2012: Editorships added. Don't See Yours? Please Contact Us! Jun 2012: HKU Knowledge Exchange Non-Academic Prize awarded to David Palmer and the Hub Team, for their success in making HKU research and scholars highly visible. Go Team! Apr 2012: DOI numbers added to each of the 19,750 HKU theses. Increased discovery and statistics. Feb 2012: New design and software for the Hub. Jan 2012: Open Access Publishing for HKU authors, free! or nearly so. Dec 2011: HKU 100 Research Excellence -- Interviews with scholars.